Domestic pets to be replaced by robotic imposters by 2025? Robotic pets could replace the real things in a few decades, according to an Australian based researcher. An increasingly urbanized population could mean real animals remain only for the super-rich, and robotic imitations could become the norm. The paper was published by Dr Jean-Loup Rault, an animal welfare researcher from the University of Melbourne, who says the market for robotic pets will take off in the next 10 to 15 years, with large tech companies already jockeying for position in the new market. 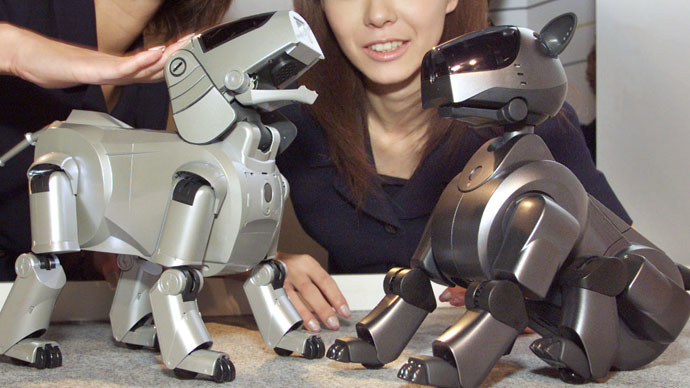 "Pet robotics has come a long way from the Tamagotchi craze of the mid-90s. In Japan, people are becoming so attached to their robot dogs that they hold funerals for them when the circuits die," Rault wrote in the paper published in the Frontiers in Veterinary Science journal. The reasons for the possible shift from real pets to robotic versions are likely to be caused by the increasing urbanization of the planet. Currently, over half those in the Western world own a pet, with rapid growth in Asia, where having a domestic animal is seen as an example of one’s social status. However, with the global population expected to rise to almost 10 billion by 2050, Rault doesn’t see how keeping domesticated pet can remain viable. “A more realistic future is that pets may become a luxury possession for people who can afford to sustain their cost and fulfill their needs in terms of space, social, and mental needs according to possibly higher ethical standards raised by future societies,” he said. “We are possibly witnessing the dawn of a new era, the digital revolution with likely effects on pet ownership, similar to the industrial revolution which replaced animal power for petrol and electrical engines,” the animal welfare researcher wrote. However, the researcher believes the possible explosion in popularity of virtual pets could be a double edged sword. On the one hand, it would allow the elderly and those with allergies to experience having a ‘pet.’ But if the population gets used to not having to feed or exercise a robotic pet, this could have a detrimental effect on the treatment of domesticated animals. Dr Rault also cited the example of the Paro robot. This is a robotic baby seal, which has been designed to engender positive responses from those using it. It has even been classed as a medical device in the US, with the designers deliberately using an unfamiliar animal to overcome expectations people may have had from a popular domestic pet. The development and advancement of robotic pets could also have unforeseen dangers. Bill Gates has warned that artificial intelligence poses a real threat to mankind, while Professor Stephen Hawking adds that due to the slow evolution of humans, they may not be able to compete and would be superseded by artificial intelligence. “Are animals what make us humans? Or are we witnessing a leap into what domestication always was: to select animals to be perfect pets, with a need to update the definition of pets as an animal or an artificial device kept for pleasure?” Dr Rault concluded.